If your dog is having a hard time gaining weight and lean muscle, then it’s time for you to reevaluate the food that you're feeding him. Is it high in protein and fat? Is it made without useless fillers and artificial ingredients? Dogs need a specific diet to gain weight healthfully. If you're worried about your pooch, consult with your veterinarian about the best dog food for weight gain. Helping your dog to gain weight sounds like a simple task, but if it's not done properly it could lead to serious health consequences. Some of the options mentioned below may be perfect for your dog, but it’s important to consult your vet before switching to any new type or brand of the best dog food for weight gain. * Click on the best dog food for weight gain for more information and prices, or scroll down below for more details. We’ve previously discussed the nutritional requirements for dogs. Unfortunately, it's not easy to figure out what your dog should be eating every day. The nutritional requirements of a typical dog should be based on his age, weight, breed, activity level and health condition. A healthy diet is critical for all dogs, but it’s especially important for dogs that are underweight. You need to find the best dog food for weight gain that allow their body weight to increase by adding lean muscle. Increasing the fat content in the food will only cause Fido to pack on unnecessary fat, which will actually have a negative effect on his health. As previously mentioned, there are many variables that will effect which dog food is best for your pet. This is the case whether your dog needs to gain weight or not. 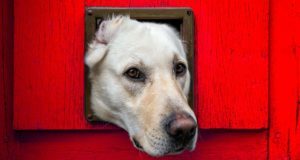 Every dog's body is different, and that means that the required amount of protein, carbohydrates, vitamins, minerals and fat will be different for each canine. Choosing a dog food isn't just about what it offers, either. It's also about what is does not offer. Finding a product that is free from artificial ingredients, unnecessary fillers and toxic chemicals is of the utmost importance. Not all dog food products are created equally, and you need to select the highest quality for your beloved pet. A veterinarian or a canine nutritionist can help you find a diet that will meet your individual dog’s specific nutritional requirements. 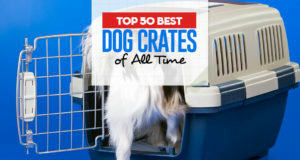 They can also guide you in finding the best dog food weight gain that is specifically made with quality ingredients. Working with a professional is the only sure way to find the best dog food for weight gain that will be nutritionally appropriate for your pet. 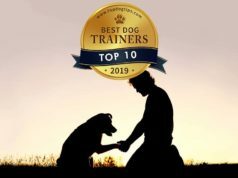 We cannot stress enough how important it is to consult an expert to learn about the appropriate nutrition for canines and the many diets available that can provide that nutrition. 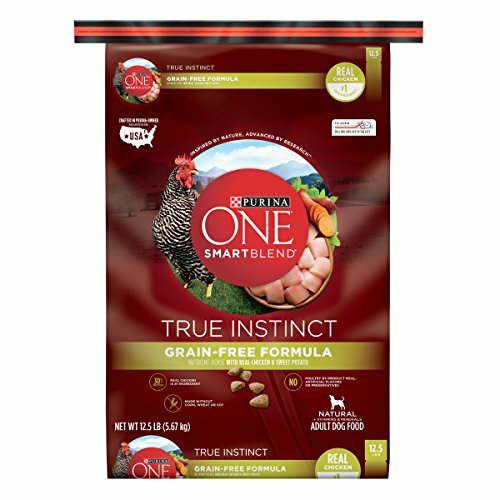 Purina ONE True Instinct Grain-free Dry Dog Food chicken and sweet potato formula is developed for adult dogs. This best dog food for weight gain is nutrient-dense, grain-free and contains real chicken, chicken meal, cassava root flour, and sweet potatoes. Its 30% crude protein content and 442 kcal of metabolizable energy (per cup of food) are great numbers to start with if your dog has an active lifestyle and needs to gain some weight. This rich-tasting formula has crunchy triangular kibbles that can be moistened or served as is. Dogs love the taste and always finish their share without trouble. You know that their food is fulfilling to them, because they don’t keep begging for food. After a meal of Purina ONE SmartBlend True Instinct Grain Free Nutrient-Dense Formula Dry Dog Food they’re fueled for the day and are active till their next meal. 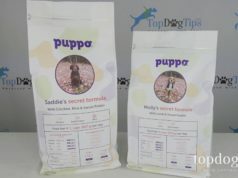 Your dog won’t need supplements because this bag contains all the vitamins and minerals that dogs need and it has good levels of glucosamine and omega 3 and 6 fatty acids. Compared to other grain-free recipes, this one is priced more competitively, and digestion or sensitivity issues are rare. Eukanuba Premium Performance Dry Food delivers optimum levels of protein and fat (30/20) and calcium to support lean muscles and strong bones and sustain an active dog’s energy needs. It is made with chicken, chicken by-product meal, corn meal, brewer’s rice, fish meal, sorghum, chicken fat, beet pulp, dried egg product, and fish oil. It is enriched with vitamins and minerals, and has adequate levels of chondroitin and glucosamine to ensure healthy joints. 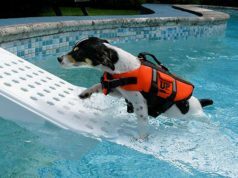 This has enormously helped working dogs that had difficulty keeping their weight on. Not only have dogs attained their ideal weight and kept it, they also bloomed on Eukanuba Premium Active Adult Dry Dog Food. They have strong bones and joints, which they need in their high-level activity, and have glossy coat and healthy skin. The nice thing about using this product to boost your dog’s weight to normal levels is that there’s no need to overfeed dogs to attain that objective. The correct food dose recommended for your dog’s age and activity level does that after a short time. MVP K9 Formula Mass is an all-breed solution for adding bulk on skinny dogs. Picky dogs or dogs that recently went ill need some perk in their diet to give them more weight, and Formula Mass may just have what it takes. This powder formula from MVP K9 Supplements has 28% crude protein and 50% crude fat – you won’t find fat content this high in most dog food formulas. This healthy fat provides an energy source to sustain your dog’s high-energy activities and recovery without relying so much on the body’s protein resources, which are best used up for building and repairing muscles. This formula is an add-on or topper to your dog’s regular wet or dry food. Its ingredients are vegetable fat, whey protein, flaxseed, and creapure. Aside from fat and healthy calories, MVP K9 Formula Mass Weight Gainer for Dogs is also a good source of 18 naturally-occurring amino acids that support muscle strength and repair. This is a must-try for dogs that need to regain their energy and lost weight. It packs a lot of other benefits, too, such as nicer coats and more alert disposition. It’s very easy to use since you don’t need to change your dog’s food, so there will be no drastic change in your dog’s setup. Bully Max High Performance is a 30/20 formula like Eukanuba Premium Performance, and has a whopping 535-calorie content (per cup) which is the highest in our list and possibly in this category. It is made with chicken meal, brown rice, chicken fat, beet pulp, sorghum, barley, brewer’s yeast, flaxseed, fish meal, egg product, fish oil, probiotics, and vitamins, minerals, and amino acids. The increased calories that Bully Max brings to your dog’s diet adds energy which is vital in gaining weight, building body mass and muscles, and increasing strength and alertness. This dog food packs a lot of calories and, fortunately, it’s also flavorful, because it would be such a waste if dogs didn’t like it. Dogs take quite easily to it and have no problem switching. In as short as 2 weeks on Bully Max High Performance Super Premium Dog Food you’d already notice some bulk forming. 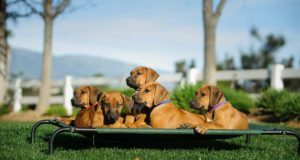 Dogs are not simply gaining weight in this formula – they’re more active, too, which is very important. Their skin and coat show great health. A few skin irritations were noted with Bully Max, but that’s a dog issue not the food per se. Overall, this is a great option for dogs that need to fill out. Purina Pro Plan Natural grain-free lamb and egg formula’s animal protein sources are lamb, chicken meal, and dried egg product. It is grain-free and uses alternative carb sources like pea starch and cassava flour. It also contains vitamin supplements and chelated minerals. It has optimal ratios of omega 3 and 6 to ensure healthy skin and coat. The significantly high fiber level aids in improving bowel movement and regulating blood glucose. Dogs that were switched to this transitioned beautifully – even some dogs that had very sensitive tummies – and are doing great on Purina Pro Plan Natural Grain Free Dry Dog Food. Their hair turned glossier and they’re at their ideal weight, which are the easiest ways to tell how a dog does on its new formula. The lamb and egg combination is a hit to the palate of most dogs, so it has helped them eat properly and attain their proper weights. The small kibbles are perfect especially to some dogs with problematic teeth, which may get discouraged from eating large bites. Instead, they get to eat and finish their portions. Highly palatable meals can make dogs over-eat and be obese, but the high fiber content of Purina Pro Plan Natural will also help keep things in check. 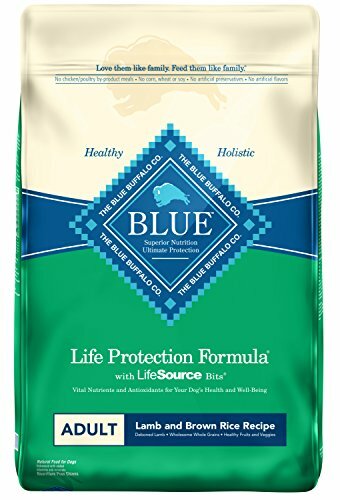 Blue Life Protection Formula from Blue Buffalo is for adult dogs and is made with deboned lamb, oatmeal, barley, turkey meal, brown rice, sunflower oil, probiotics, and vitamin and mineral supplements. There are two kibble types – the first type is triangular in shape and brown, while the other type (called LifeSource Bits) is pebble-shaped and dark. The LifeSource Bits are made with blueberries, cranberries, spinach, flaxseed, pomegranate, and other antioxidant-rich fruits and vegetables through a low-temperature process. This dog food has adequate levels of protein, fat, and total calorie count that dogs need for growing muscles, supporting body functions, and sustaining play and activities. Appropriate feeding methods and correct food dosage will help in attaining the proper weight for dogs who are on Blue Life Protection Formula Adult Dry Dog Food. Dogs love the taste of Blue Buffalo, and this lamb recipe especially, so dogs that usually lack appetite take easily to this and finish their portions clean. This makes gaining weight so much easier. It’s very important to consider your dog’s current weight and activity level when deciding on the amount to feed. 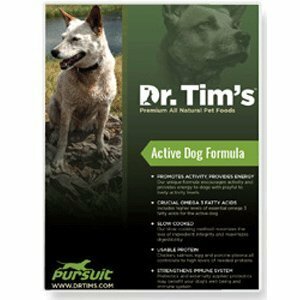 Dr. Tim’s Premium All-Natural Pet Food Pursuit Active Dog Formula is so calorie-dense that you need not feed as much amount of food as Blue Buffalo or other dog food for that matter. It is made with chicken meal, ocean herring meal, salmon meal, porcine plasma, and other protein sources. Its carb and fiber content comes from brown rice flour, oat flour, beet pulp, flaxseed meal, rice bran, and psyllium seed husk. It has added vitamins and minerals and probiotics for healthy digestion and strong immune system. This food is developed for dogs that have active lifestyles – dogs that jog, run, and play almost every single day. This high-calorie food helps to keep them in top condition. Dogs that have been on Dr. Tim's Premium All Natural Pet Food Pursuit Active Dog Formula for a considerable period of time are able to keep their ideal weight and have well-toned muscles. They have great energy, have shiny coat, and always have the appetite for their food. They never seem to get tired of it and never turn down a meal, so it must taste very good. If your dog needs some filling out, this can help her/him gain weight nicely.